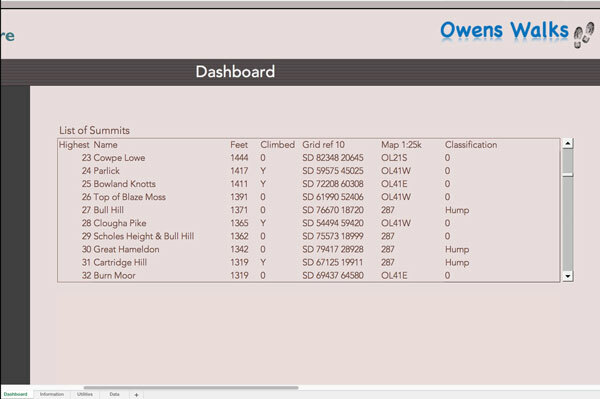 I have created this generic Walking Log using Excel, as an 'Owens Walks' supporter you may download the Excel Workbook for free and use it/customise to suit your own requirements and most importantly, stay in control of your own data. I'm a great believer in controlling my own data, I don't like Google, Amazon, Garmin or any other App controlling my data, I prefer to create my own methods of data management and stay in control. 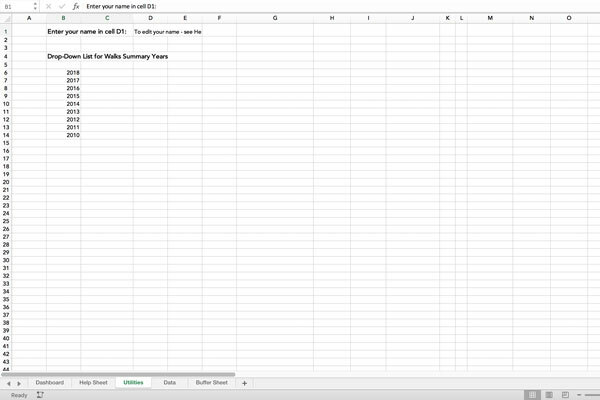 So here is a free download, it's an Excel Spreadsheet so you will need Excel to run it - it has a few macro's running which you can edit, delete or add to and customise your own Walking Log. Owens Walks is completely FREE and Open for all to enjoy. We do not collect your data and there is no log in, this means your data (email address is completely safe - because we don't have it). However if you wish to receive our Newsletters, you can subscribe and you will be the first to hear the latest news - stay up-to-date with all the latest news, updates and developments on the Owens Walks website. Just send us your email and we will add you to our distribution list. And remember, your data is stored off-line and will never be shared with any 3rd party. a Dashboard sheet which includes 'Your Latest Walk', 'A Year-by-Year summary' and a scrollable list of all your walks. These features are produced using macro's which you can edit to suit your own requirements. a Help sheet explaining how the macro's work. 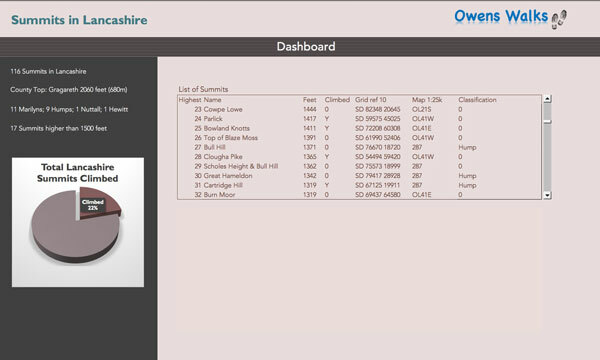 There's also help on how to edit your name on the Dashboard to customise your Walking Log. 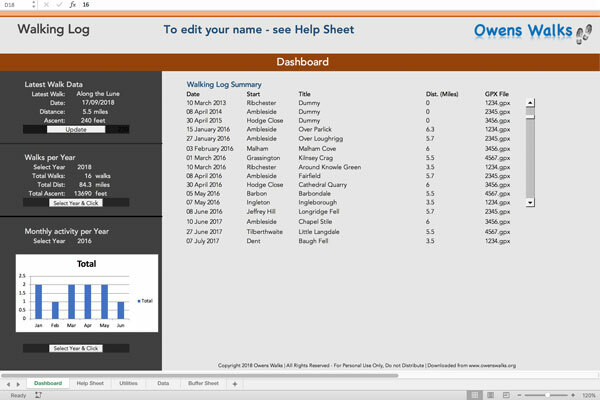 a Utility sheet used for Customising your Walking Log, this sheet is where you edit your name for the Dashboard, you can also edit the drop-down menu used by a macro. 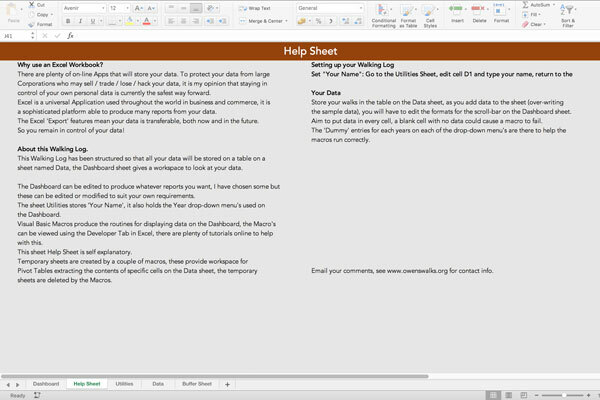 a Data sheet, the Workbook contains some 'dummy' data so the macros work. The data table is where you will add your own data to suit your needs. The table structure can be edited but any changes should be edited in the macro's as required as they look up the data for the Pivot-Tables/Charts. Feel free to edit the Table to suit your own requirements. 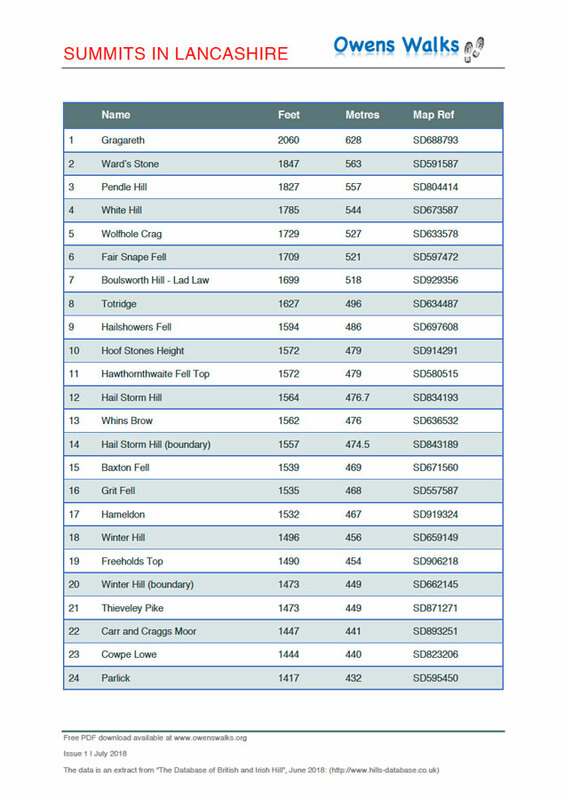 Here is a simple Excel spreadsheet listing all 116 summits in Lancashire. I have created my list of Summits in Lancashire from the Hills of Britain database (June 2018), see www.hills-database.co.uk. 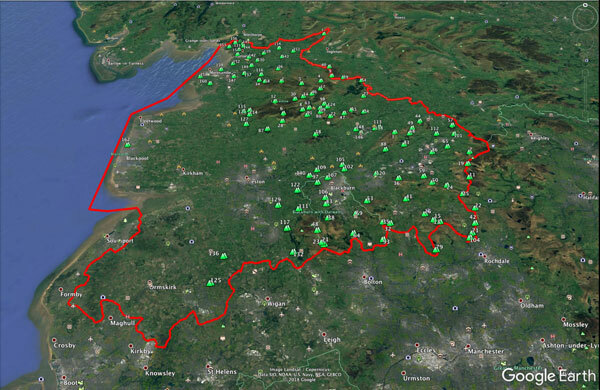 I mapped the Lancashire summits on Google Earth with the County Boundary before finalising my list, if you want to edit the list, just download the FREE Excel spreadsheet and customise it to your requirements. a Dashboard with a scrollable list of all the summits. You can easily edit the list to suit your requirements. an Information sheet - it's probably unnecessary as the spreadsheet is self explanatory. a Utility sheet holding the Pivot-table for the chart. 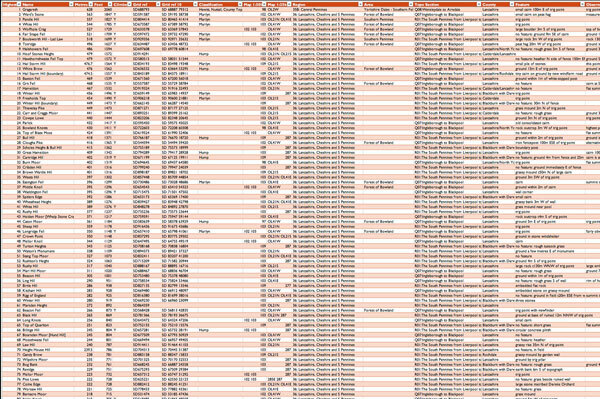 a Data sheet, all the Summit data is held in a table, there's much more information held about each summit. 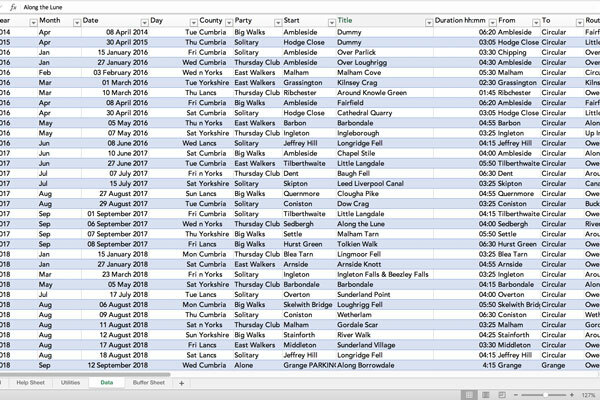 You can of course edit the table to record your climbs and dates etc. It is up to you. Copyright ©2010-2018 Owens Walks. All Rights Reserved.